Financial institutions realize the value of incorporating video security as part of their operations plan. 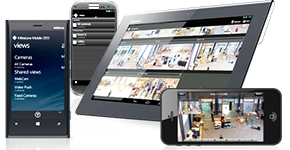 No other form of electronic surveillance provides for real-time event monitoring – both at the location and remotely – while simultaneously providing indisputable documentation of an event. Whether serving as a visual deterrent to crime or giving managers the tools they need to expedite investigations and evaluate operational costs, video offers the most practical and cost-effective solution available. From a small-town bank to a large multi-Branch with Hundreds of branches, C&CC proudly offers the industry’s most trusted and completes selection of video security products and services. These open systems also seamlessly integrate with third-party technologies – access control, alarm systems, ATM System, for example – to provide an unbreakable net of protection over any facility. And with the increasing development of intelligent camera systems and embedded VMS analytics, security professionals have access to more information than ever before to detect and isolate abnormal or suspicious activity.